The Deacon and Deaconess Board members are the spiritual leaders and servants for the congregation. During alter calls deacons and deaconesses provide spiritual support and comfort for individuals. They also take it a step further by making personal visits and phone calls. Also on first Sunday of each month the board takes on the responsibility of preparing and serving communion for the saints as well as serving it to the sick and shut-in members of the congregation. The board handles the task of setting up the Maundy Thursday services, which includes foot washing and communion. Preparation of the baptismal ceremony is carried out by the board on the first Sunday of each month. The benevolent fund, which is a monetary assistance available to members of the congregation and others that are temporarily in financial need, is managed by the board. The board reviews these written requests, and monetary aide is granted depending on available funds and the type of assistance requested. These Benevolent funds are raised by the congregation as a form of a specialized offering, generally held on second Sundays of the month. 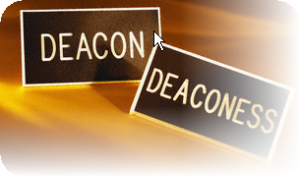 The Deacon and Deaconess Board have organized several ministries. These ministries include the Singles Ministry which involves meetings and outings for the single members of the congregation. Another is the Brotherhood Ministry which is a fellowship of the men of the congregation. And last the Care Ministry in which members partake in home visits and small group fellowships for the sick and shut-in members of the congregation. The board is taking on new commitments and approaching new objectives, one being, to make a conscience effort to improve and increase membership contacts. Involvement with the newly developed ministry is wanted.